With this all purpose blade for tables saws you can rip and crosscut 1" ? 2" rockhards and softwoods resulting in a smooth-as-sanded surface. With 20 DEG face hook, ply-veneers will crosscut with no bottom splinter at moderate feed rates. Double hard and 40% stronger C-4 carbide will give up to 300% longer life between sharpenings. Ends blade changing (one blade does rip, combo and crosscut). Ends second-step finishing. Ends cutting 1/16" oversize to allow for resurfacing. Buy and sharpen one blade instead of 3, (24T rip, 50T combination, 80T crosscut). 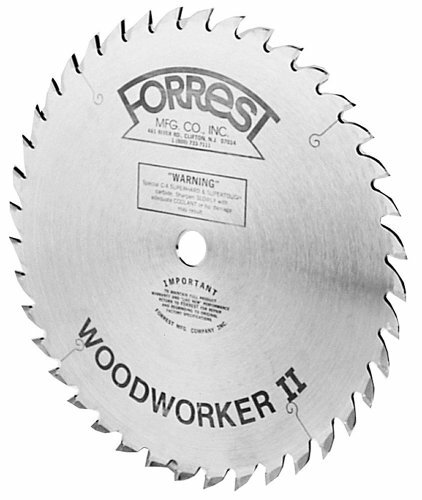 Forrest Saw Blades dampener helps kill saw scream-whistle from a vibrating blade surface. Dampen out motor and belt vibrations from being transmitted up to the rim of the teeth. Hold blade rigid and true for better cuts on your machine. Are hardened and precision ground flat within .001" to keep your blade true. This saw blade is nothing short of fantastic. This blade has been used to rip and crosscut all types of wood with excellent results. Leaves a cut so smooth you would swear it has been sanded. No need for a jointer to smooth edges with this blade. Absolutely NO rip-out when cutting plywood. Well worth the money. After reading many reviews and suggestions by others about using a lower tooth count on a 1-3/4hp saw, I decided to take a chance and spend the money for this blade. I've normally purchased the cheaper combo blades but was always dealing with tear outs, burning and bogging down my saw. Once I had this installed I ran a few test cuts on some 4/4 hard maple and I was astounded. The cuts were absolutely smooth, nearly as good as my jointer, and certainly good enough for glue up. It's also very quiet, and goes through hard wood with ease. I used to have to put some effort into feeding my lumber, but this blade made it seem like I was only pushing the piece from one side of the table to the other. I haven't had the chance to do any crosscuts, but considering how it performed on the rips I think it'll do well, and certainly better than my former blades. I also bought the stiffener which may have added to the quality of the cuts. I'll definitely be considering getting a second blade from Forrest before I send this one in for sharpening. 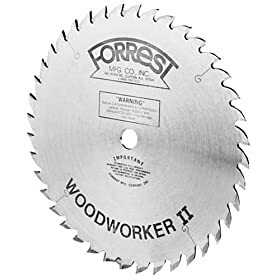 I'm a long time fan of the famous Forrest WWII 40 tooth 10" blade, and have had the opportunity to try many other top ranked 40 and 50 tooth "multi-purpose" competitors. One thing I've noticed is that the high quality 40T general purpose blades and 50T combo blades all offer alot of versatility and result in glue line caliber cuts in materials up to thicknesses of ~ 1-1/2" to 2". Beyond that they labor more and require more saw power than I can currently offer. The common solution is to install a 24T ripping blade to make those aggressive rips in thick stock. The downside is that the dedicated ripping blades don't leave as smooth of an edge, and leave unacceptable tearout in crosscuts. Enter the 30 tooth WWII general purpose blade. It has the same tooth geometry as its 40T counterpart, but the lower tooth count leaves more room for larger gullets between the teeth, which in turn allows for more efficient chip removal, which ultimately allows ripping thicker material more efficiently. The typical downside of the lower tooth count was noted above with the 24T blade, a noticeably rougher edge. The sheering action of the sharp alternating bevel tooth grind (ATB) of the WWII combined with it's high quality materials and precision sharpening give the 30T WWII an impressively clean cut. I can't go as far as to say it's as clean as the 40T version, and it'd be illogical to claim that it's cleaner...it's not, but the decline in cut quality is very minimal, and still results in a glue line edge. It's an excellent trade off for the increased feedrate and ability to rip thicker materials with ease. I think the 30T WWII is an excellent alternative to the more standard 40T version, especially if you tend to rip thicker materials or have a smaller saw. It'll do a large portion of the ripping that I've traditionally done with a dedicated 24T ripper, yet will still crosscut well and leave a suitably clean edge for the vast majority of tasks. As was true of the better 40T and 50T blades, I'll still have very little need for an 80T blade, which makes this one the most versatile of the high quality blades I've used. Got this blade to replace the stock 40T combo blade in my Ridgid 3660. The difference in ease of ripping and overall cut quality is night and day. Blade runout at tips is under 0.002" (stock Ridgid was 0.008) which I consider pretty good. Cutting a variety of 4/4 hardwood this blade has never been strained at all, even with an aggressive feed rate. Cut edges are glue-ready, very few faint saw marks. If your saw is properly aligned, this blade will make amazingly clean rip cuts. Crosscutting hardwoods and pine is also effortless, and the cut quality is far better than the stock Ridgid blade. While not as polished an edge as the 80T Freud LU74 that I'd used as a dedicated cross-cutting blade for both my CMS and TS, it is close enough for pretty much everything. I don't bother swapping out the 30T WWII for crosscuts anymore- I just leave the LU74 in my CMS now. Overall, great blade for 1-1/2 HP saws where cutting hardwood is a primary task. I have a very nice cabinetmaker's shop, and appreciate good tools, both hand and machine. This is the third Forrest blade I've bought, because they are SO superior to other brands. (I also have their 80 tooth crosscut, and a thin kerf combo blade). I even quit having my saw/planer/jointer blades sharpened locally, because Forrest does such a superior job sharpening all of these. It's not as convenient, but the quality is worth it. You will NOT regret spending the money for this blade. I bought this as a less-costly replacement for a 40 tooth thin kerf WWII that I accidently ran a screw through and broke off twelve teeth. This was touted as almost as good and a good choice for an underpowered saw. I used this with my 1.5 hp. unisaw with the stabilizer disc. I would agree that it is almost as good as the 40 tooth and is better than the other brands I have used. It tends to burn more than the 40 tooth with not quite as clean a glue line, and for the results, I would spend the extra money for the 40 tooth, as the results with it are fantastic.